The first notes of Boston Civic Symphony’s Sunday afternoon concert sounded from offstage at Jordan Hall leading off a good romp of Prokofiev’s Lieutenant Kije. Placed just back of the podium, a cimbalom reechoed Hungarian fare in an impressively styled performance of Kodaly’s Háry János Suite. That was one side of the program, color-filled swatches, oom-pahs, an orchestral sneeze, a double bass solo, and bunches of fun. The programming of “Two Fables and a Masterpiece” educed contrast of considerable magnitude. I wondered what effect might have been wrought had the two sides been reversed. A sharper, fresher focus might have been brought to the Brahms, the lighter pieces of Prokofiev and Kodaly saved for after the intermission might have had the listeners back up on their feet and heading home on an upbeat. However, judging from the immense reaction of the audience at concert’s end, one would have to suppose that the BCS had it right after all. Round after round of applause brought Music Director and Conductor Max Hobart and Rosenbaum back on stage—their gracious and truly appreciative acknowledgement of such enthusiasm a breath of fresh air. All kinds of orchestral goodness appeared in the Lt. Kije Suite. Young student guest conductor Konstantin Dobroykov proved himself on the up tempo pieces, the slower ones, though, lagged. Hobart conducted the rest of the time, melding a richly diverse population of orchestral players in that musical sneeze that begins the Kodaly all the way through to its fortisisimo end. Low brasses were quite something sonically, especially in their solo and sectional passages. A pity it was difficult to hear the cimbalom much of the time. The entire BCS sounded strong in a well-tuned wildness just right for this amusing tale of a classical hero. Both the “Intermezzo” and the “Entrance of the Emperor and His Court” had me believing I might very well be hearing a professional orchestra. Clean-cut, power-punctuated trills taken as octaves seasoned the opening Maestoso movement. Following that, rather than anguishing and demonic dancing in the Brahms, I heard finely textured pianism all the through the concerto. Rosenbaum and Hobart balanced their respective weights overall. 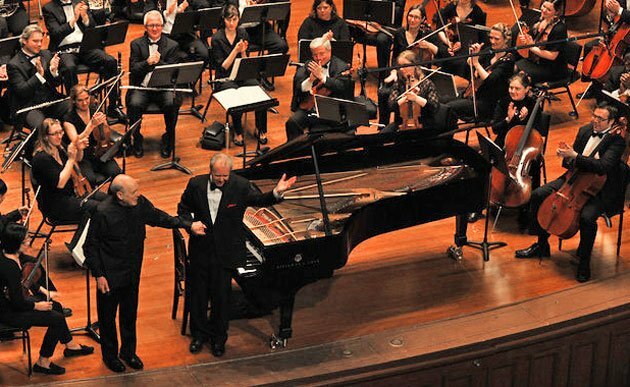 Rosenbaum, whom Bostonians also know as former chair of the NEC piano department for more than ten years and as Director and President of the Longy School of Music from 1985-2001, completely conquered the pianistic challenges of this formidable concerto. It became increasingly obvious that his understanding of Brahms runs deep. The BCS-Hobart-Rosenbaum performance could be described as an achievement meriting genuine praise. It is still surprising to recall that the Boston Civic Symphony is the second oldest symphony orchestra in the city, having been founded in 1924 by the late educator, conductor, and composer, Joseph Wagner. BCS is currently Orchestra-in-Residence at Regis College, where the orchestra will play its final concert of the 2012-2013 season on April 28th at 2:00 pm. Sounds like an excellent, excellent concert. Wish i could have been there! Bravo to all.